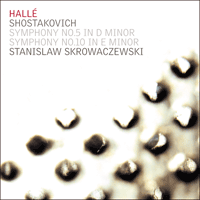 Shostakovich’s Fifth is among the most frequently performed of twentieth-century symphonies. In 1936, a year and a half before this symphony appeared, Shostakovich had, on Stalin’s instructions, been savagely attacked in the press for the supposedly pornographic and modernist excesses of his opera Lady Macbeth of Mtsensk, as well as for his ballet The Limpid Stream. Following these attacks the composer was made all too aware that his very life was in danger (as also, of course, were the lives of many hundreds of thousands of other people apart from Shostakovich). As a result, he decided, in the summer of 1936, that it would be wise to withdraw his newly completed and highly experimental Fourth Symphony before its first performance. It was against this sombre background that he sat down to compose his Fifth Symphony. It was against this background, too, that after his new work had been given a triumphant first performance on 21 November 1937, it was famously described as ‘A Soviet artist’s reply to just criticism’ (this description appeared in a Moscow evening newspaper in January 1938, nearly two months after that first performance). Nowadays, especially since the fall of the Soviet Union, most Westerners have, at least from time to time, found themselves trying to grasp something of the apparently inconceivable scale of the horrors of Stalinism. Books, television programmes and newspaper articles have rained words and images upon us. As with our somewhat parallel reactions to what we know of Hitler’s Germany, we have discovered that there is a certain limit to our emotional responses to information of this kind. Perhaps this is why the music of Shostakovich has now come to play a role in the imaginations of some Western people that is not so far removed from the role that it has long played in the imaginations of many ‘Soviets’, and especially Russians. The overwhelmingly tragic undertow of the music, its bitter ironies, its dramas of the grotesque, the absurd and the banal—all these seem to answer our need for an imaginary film-score to help us to feel the meaning of what it is that we have been told. The grandeur, pathos and sheer scale of Shostakovich’s music suggest appropriate responses to such experiences where our words seem to fail us. There might well be some truth in the report that Shostakovich himself agreed to the subtitle ‘A Soviet artist’s reply to just criticism’. It would have been utterly characteristic of this supremely ironic man to have done so. The symphony is indeed his awe-inspiringly creative reply to criticism, as well as being the only reply that was practically possible for him. As for those adjectives ‘Soviet’ and ‘just’, their tawdry hollowness is now as audible as the similar hollowness of the march in the symphony’s finale. To anyone who already knew Shostakovich’s music and who heard this work at its first performance under Evgeny Mravinsky in Leningrad in November 1937, it must have been clear even from the opening notes that here was an artist who had entered upon a new field of experience, a new way of listening and a new way of making other people listen. It is almost as though Shostakovich had poised himself between the heroism of the musical past and the horror of the present, balancing the moral demands of each against the other. The first movement begins with music that is both a slow introduction and the symphony’s exposition (exposing, incidentally, the material not only of the first movement, but, as it later turns out, of the other three as well). Quite near the very opening, just after the first four bars or so of jagged dotted rhythms, there begins a rocking accompaniment in the lower strings over which the first violins enter with the symphony’s first quiet suggestion of a melody. This melody begins, naturally enough, in the symphony’s home key of D minor. However, in its very first phrase it descends the scale of five notes and lands not on E natural (which our ears would expect) but on an unexpected E flat. The bitter-sweet effect of this ‘wrong’ note (making the music seem hauntingly modal, like folk music or early church music) is the beginning of one of the main musical arguments of this symphony. You don’t have to be a musical analyst to feel the power and logic of the way in which the composer takes us on a journey from the bitter-sweet experience of a single note to the bitter-sweet experience of a whole complex but profoundly organised symphonic world. Interestingly the scherzo, in A minor and marked Allegretto, sets off at the same speed as the climax of the first movement’s development. In other words, the scherzo is, as it were, taking off from the point where that development had left off. Although the quite new character of the second movement (with its almost startling likeness to a Mahlerian Ländler) might seem a long way from the world of the first movement, as Shostakovich begins to twist and turn his delirious fragments of triple-time dance music, they begin to yield up echoes and memories of the earlier music. For the slow movement in F sharp minor, Shostakovich takes the unusual step of dividing the violins into three equal parts, as well as dividing the violas and cellos each into two parts. The resulting eight-part string texture is what gives the string writing of this Largo its peculiar feeling of mass and sonority. Like the thematic material of the scherzo, the material of this movement, although it grows into a sonata structure of a kind, also holds our attention by suggesting a network of affinities and connections with the themes of the first movement. In particular the descending five-note phrase with its bitter-sweet E flat from near the beginning of the whole work here reappears, changing itself in front of our ears into a whole variety of new guises. The last movement begins with that famous march ‘as if someone were beating you with a stick and saying: “Your business is rejoicing, your business is rejoicing”’. As in the first movement Shostakovich takes tremendous care to construct a precise and calculated acceleration resulting in music that is fraught with menace. It is at the height of the acceleration that the character of this music suddenly changes in a manner akin to that of a translation into another dimension of time. All around us is suddenly gentle, spacious and lilting; the horror and the bombast seem dramatically to have ebbed away. The high strings are heard rocking backwards and forwards on two notes. This rocking figure, a gentle oscillation, is an idea that recurs again and again in Shostakovich’s work from the very beginning to the end of his life. If not always actually a quotation, it is usually at least a reference to one of the most famous moments in Russian music, a moment from one of Shostakovich’s favourite works, Mussorgsky’s Boris Godunov. The moment in the opera from which the figure comes is the opening of the monastery scene, where the curtain rises to reveal the chronicler-monk Pimen writing at his desk. The rocking seems to suggest the old man’s hand moving across the parchment page. Pimen tells us that his task is almost done, that in his chronicle he has set out all that has happened in his age so that future generations may read the truth of the crimes of tyrants and the sufferings of ordinary people. Pimen regards his work as not merely a history, but a vessel of judgment. Amongst Russian musicians and music-lovers it has now become almost commonplace to describe Shostakovich’s works as not merely music, but as part of a continuous moral chronicle. After the Pimen motif from Boris Godunov, Shostakovich makes fragmentary references to a little song, Rebirth, he had set a few months earlier to words by Pushkin. The song describes how, with the passing of time, the crude daubings of the barbarian will dry and flake off like old scales. The beauty of the original painting, which had been obliterated by the barbarian, will become visible once more. Gradually these sketchy references transform themselves into the features of the third verse: ‘Thus the delusions fall away, From my worn-out soul’ until finally, at the point just before the return of the brutal march from the beginning of the movement, the strings spread out into a radiant chord of B flat major over which the harp can be heard playing almost the very music that, in the song, the piano plays to accompany the words of the second verse. So what did the composer do with the song’s first verse, with its description of the artist-barbarian crudely daubing over the painting of a genius? As it happens, the opening notes of his song, turn out to be exactly the same as the very opening notes of this finale, the main theme of the march that begins and ends it. In other words, this march is the march of the artist-barbarian himself. It takes no great imagination to realise who, in Shostakovich’s mind, was that great barbarian, daubing crudely over the creations of others and obliterating the beauty in his path. If this music is played as it should be played, following the composer’s precise and detailed instructions, then its meaning will be clear. The march will indeed seem like a gross and hideous act of obliteration. We do not have to know the words of Pushkin’s poem to be moved by the weight of the catastrophe. It will seem almost incredible that anyone could ever have been musically insensitive enough to have supposed that this music suggested the smallest capitulation to the demands of a tyrant. Yet it is part of the strangeness of Shostakovich’s finale that no amount of histrionic tub-thumping in D major on the part of the enraged barbarian can quite obliterate the radiance of that earlier moment, minutes before, when Shostakovich had conjured up in his own mind his private memories of that tiny Pushkin song, Rebirth, written at the very beginning of what was a new period, a new way of thinking and feeling, both in his life and in his music. In newsreel and feature films from the Eastern bloc in the late 1940s and early 1950s, the postwar period is portrayed as one of cheerful reconstruction, bolstered by the victory over fascism and over-shadowed only by the need for vigilance against supposed Western imperialism. It took no more than the death of one man, on 5 March 1953, to remove the keystone of that false façade and to begin the slow collapse of the entire edifice. No individual had more cause to rejoice in the death of Joseph Stalin than Dmitry Shostakovich. Since his humiliation in the ‘anti-formalism’ purges of 1948 he had been stripped of his teaching positions in Moscow and Leningrad, he had been forced to present the Soviet Union at a series of international so-called peace congresses, where he parroted his compulsory thanks for the ‘wise guidance’ of the Party, and he had to prostitute his art by composing film scores to craven hagiographies of Stalin. By March 1953 he had a sizeable number of more serious works awaiting either first performance or rehabilitation. This may help to explain the unprecedented eight-year gap since his Ninth Symphony of 1945—previously he had composed one symphony more or less every other year. It also accounts for the extraordinary release of pent-up intensity conveyed by the Tenth. In 1979, four years after the composer’s death, Solomon Volkov’s Testimony reported him as stating that the Tenth ‘is about Stalin and the Stalin years’. Indeed nothing could be more natural than that the music should reflect Shostakovich’s feelings during the first summer after the dictator’s death. At what level it does is a matter for some debate. Suffering is obviously at the heart of the massive first movement. But then so is musicality. This is the most complex and most carefully composed of all Shostakovich’s symphonic first movements, the least rhetorical in its surface gestures, the most subtle in its large-scale construction. It progresses with absolute conviction from its initial Tchaikovskian gloom, through the soulful singing of a clarinet and the intimidated dancing of a low flute, to an overwhelming central climax and the final lament of two piccolos. But this emotional scenario is simultaneously woven into a web of intricate polyphonic lines, lending it universality and permanence in the language of music. The whirlwind second movement comes nearest to a graphic depiction of savagery. This, according to Volkov’s report, is ‘a musical portrait of Stalin, roughly speaking’. The words ‘musical’ and ‘roughly speaking’ are again worth pondering. For Shostakovich, once a musical idea is born, from whatever source, it takes on a life of its own and directs the flow by musical means as much as by any programmatic story-line. At least one enigma can be satisfactorily resolved in programmatic terms, however. The Allegretto third movement, which begins with a tiptoeing idea in the strings, features two themes with acknowledged personal significance. The stabbing woodwind idea heard a couple of minutes in is based on Shostakovich’s musical monogram DSCH; the notes D-E flat-C-B natural refer both to the German musical letter-names and to the German spelling of the composer’s Russian initials. What then of the mysterious unaccompanied horn call which emerges out of the blue a couple of minutes later? This, as was finally realised in 1994, spells out the name Elmira, the notes E-A-E-D-A being a cryptic mixture of French and German note-spellings—E-La-Mi-Ré-A. This is a homage to an Azerbaijani composition pupil, Elmira Nazirova, who was Shostakovich’s muse, confidante and object of unrequited affection at the time. When the two monograms are finally heard in sad conjunction—ELMIRA still on the horn, DSCH still on flute and piccolo, the two finally together in time, but still apart in space—the symbolism is overpowering. The darkness of the finale’s introduction, with its mournful woodwind solos, is apparently dispelled by an insouciant clarinet and carefree violins. That this attempted cheerfulness is nevertheless insufficient to overcome deep-seated uncertainties is confirmed in the central phase of the movement, where speeded-up versions of the introduction’s themes return along with reminiscences of the brutal ‘Stalin’ scherzo. The crisis point is swept away by a clamorous statement of the DSCH monogram. It’s partly for the conductor to decide to what extent this movement of self-assertion is confirmed in the final pages or, alternatively, remains haunted by spectres of the past. It may be worth remembering that Shostakovich himself did not live to see the dethroning of Socialist Realism or the collapse of communism, and he was too much of a realist to believe that he would do so. Easy optimism was never his style, and it may be that calculated ambivalence is part of his artistic equation in the final pages of this symphony. Be that as it may, determination and defiance are written all over the work, not just in the composer’s musical signature which is driven home by the timpani. La Cinquième de Chostakovitch compte parmi les symphonies du XXe siècle les plus souvent jouées. En 1936, un an et demi avant sa création, Chostakovitch avait été, sur l’ordre de Staline, violemment attaqué par la presse pour les soi-disant excès pornographiques et modernistes de son opéra Lady Macbeth de Mtsensk, ainsi que pour son ballet Le Ruisseau limpide. À la suite de ces accusations, le compositeur avait bien compris que même sa vie était en danger (comme l’étaient, bien sûr, celles de plusieurs centaines de milliers d’autres personnes à part lui). C’est pourquoi au cours de l’été 1936, il décida qu’il serait avisé de renoncer à la création de sa Symphonie nº 4, très expérimentale, qu’il venait d’achever. C’est dans ce contexte sinistre qu’il s’attela à la composition de sa Symphonie nº 5. Et c’est aussi dans ce contexte qu’après la création triomphale de son nouvel ouvrage le 21 novembre 1937, celui-ci fut gratifié de cette célèbre description: «la réponse d’un artiste soviétique à la critique justifiée» (on put la lire dans un journal du soir moscovite en janvier 1938, près de deux mois après la création). De nos jours, surtout depuis la chute de l’Union soviétique, la plupart des Occidentaux a, du moins de temps à autre, tenté d’appréhender au moins en partie la magnitude apparemment inconcevable des horreurs du stalinisme. Les livres, les émissions de télévision et les journaux nous ont bombardés d’images. Et comme dans le cas relativement similaire de ce que nous savons de l’Allemagne de Hitler, nous avons découvert qu’il existait une certaine limite à nos réactions émotionnelles face à de telles informations. C’est sans doute pourquoi la musique de Chostakovitch en est venue aujourd’hui à jouer dans l’imaginaire de certains Occidentaux un rôle qui n’est pas très éloigné de celui qu’elle a longtemps joué pour de nombreux «Soviets», russes notamment. Le fond extrêmement tragique de ces pages, leurs amères ironies, leurs drames du grotesque, l’absurde et le banal—tout cela semblait répondre à notre besoin d’une musique de film imaginaire qui nous aiderait à assimiler ce qu’on nous avait raconté. La grandeur, le pathos et l’amplitude de la musique de Chostakovitch suscitent en nous les réactions qui conviennent là où nos paroles paraissent impuissantes. Il est sans doute exact que Chostakovitch en personne accepta le sous-titre «la réponse d’un artiste soviétique à la critique justifiée». Pas si étonnant de la part de cet homme sensible à l’ironie. Et en effet, cette symphonie est sa réponse aux critiques, d’une créativité stupéfiante, la seule qui lui fut vraiment possible. Quant aux adjectifs «soviétique» et «justifiée», leur pontifiante inanité est aujourd’hui aussi patente que celle de la marche du finale de la symphonie, qui est son pendant. Pour quiconque connaissait déjà la musique de Chostakovitch et entendit cette œuvre lors de sa création sous la direction d’Evgeny Mravinsky à Leningrad en novembre 1937, tout dut être clair dès les premières notes: on avait désormais affaire à un artiste qui avait atteint un nouveau champ d’expérience, découvert une nouvelle manière de faire écouter les autres. C’est presque comme si Chostakovitch s’était placé à mi-chemin entre l’héroïsme du passé musical et l’horreur du présent, opposant dans la balance les exigences morales de l’un et de l’autre. Le premier mouvement débute par des pages qui sont à la fois une introduction lente et l’exposition de la symphonie (exposant, soit dit en passant, non seulement le matériau du premier mouvement mais aussi, comme on va le découvrir, celui des trois autres). Tout près du début, juste après les quatre premières mesures d’âpres rythmes pointés, commence un accompagnement berceur aux cordes graves par-dessus quoi les premiers violons entrent avec le premier indice de mélodie de la symphonie. Cette mélodie débute, de façon assez naturelle, dans la tonalité de départ de la symphonie, ré mineur. Toutefois, dans sa toute première phrase, elle descend la gamme de cinq notes et atterrit non pas sur le mi naturel auquel s’attendraient nos oreilles, mais sur un mi bémol inattendu. L’effet aigre-doux de cette «fausse note» (donnant à cette musique une sonorité modale envoûtante, comme de la musique populaire ou de la musique sacrée ancienne) est le point de départ de l’un des arguments musicaux principaux de cette symphonie. Inutile d’être musicologue pour ressentir la puissance et la logique du compositeur qui nous emmène en voyage, de l’expérience aigre-douce d’une seule note à l’expérience tout aussi ambiguë de tout un univers symphonique, complexe mais profondément organisé. Fait intéressant, le scherzo, en la mineur et marqué Allegretto, démarre à la même vitesse que l’apogée du développement du premier mouvement. Autrement dit, le scherzo reprend en quelque sorte à partir du point où ce développement s’était interrompu. Et bien que le caractère très nouveau du deuxième mouvement (qui présente une ressemblance presque frappante avec un Ländler mahlérien) puisse sembler fort éloigné de l’univers du premier mouvement, alors que Chostakovitch commence à tortiller ses fragments délirants de musique de danse à trois temps, ceux-ci commencent à produire des échos et des réminiscences des pages précédentes. Pour le mouvement lent en fa dièse mineur, Chostakovitch prend le parti inhabituel de diviser les violons en trois parties égales, ainsi que de diviser les altos et les violoncelles en deux parties pour chaque pupitre. La texture en huit parties qui en résulte confère à l’écriture de cordes de ce Largo son effet de masse et ses sonorités si particulières. Comme le matériau thématique du scherzo, le matériau de ce mouvement, même s’il évolue plus ou moins vers une structure de sonate, retient également notre attention en laissant deviner tout un réseau d’affinités et de liens avec les thèmes du premier mouvement. Et notamment la phrase de cinq notes descendantes avec son mi bémol aigre-doux présentée vers le début de l’ouvrage reparaît ici, prenant devant nous toutes sortes de nouvelles apparences. Le dernier mouvement débute par la fameuse marche «des coups de bâton». Comme dans le premier mouvement, Chostakovitch s’ingénie à construire une accélération précise et calculée résultant en une musique lourde de menace. C’est au point culminant de cette accélération que le caractère de ces pages change tout à coup, comme si l’on était transporté vers une autre dimension temporelle. Autour de nous, tout est soudain tendre, ample et berceur; l’horreur et l’emphase semble s’être complètement évanouies. Et on entend les cordes aiguës se balancer d’avant en arrière sur deux notes. Ce dessin de berceuse, avec sa douce oscillation, est une idée que l’on retrouve souvent dans l’oeuvre de Chostakovitch, depuis ses débuts jusqu’à la fin de sa vie. S’il ne s’agit pas toujours d’une citation à part entière, c’est généralement une référence à l’un des passages les plus célèbres de la musique russe, extrait de l’un des ouvrages préférés de Chostakovitch, le Boris Godounov de Moussorgski. Dans l’opéra, ce dessin intervient au début de la scène du monastère, lorsque le rideau se lève sur le moine-chroniqueur Pimène en train d’écrire à sa table. Le balancement semble évoquer la main du vieillard qui court sur le parchemin. Pimène nous apprend que sa tâche est presque achevée: il a consigné dans sa chronique tous les événements de son époque afin que les générations futures puissent apprendre la vérité sur les crimes des tyrans et les souffrances des peuples. Pour Pimène, son œuvre n’est pas simplement une chronique, elle contient aussi un jugement. Chez les musiciens et les mélomanes russes, il est désormais commun de décrire les œuvres de Chostakovitch non seulement comme de la musique mais comme les différentes étapes d’une chronique morale suivie. Après le motif de Pimène de Boris Godounov, Chostakovitch fait des références fragmentaires à une petite mélodie qu’il avait mise en musique quelques mois auparavant sur un texte de Pouchkine, Renaissance. La chanson décrit comment, au fil du temps, les barbouillages grossiers des barbares se dessècheront et tomberont comme de vieilles écailles. La beauté du tableau original, qui avait été obstruée par les barbares, redeviendra visible. Peu à peu, ces références fragmentaires prennent les traits du troisième couplet: «Ainsi disparaissent les chimères, De mon âme harassée» jusqu’à ce qu’enfin, juste avant le retour de la marche brutale du début du mouvement, les cordes s’épanchent en un radieux accord de si bémol majeur par-dessus lequel on entend la harpe jouer presque exactement la même musique que le piano joue pour accompagner les paroles du second couplet dans la mélodie. Et que fit donc le compositeur du premier couplet de la mélodie, avec sa description de l’artiste-barbare recouvrant de ses barbouillages grossiers le tableau d’un génie? Il se trouve que les notes initiales de la mélodie s’avèrent être exactement les mêmes que les toutes premières notes de ce finale, le thème principal de la marche qui l’ouvre et le referme. Autrement dit, cette marche n’est autre que celle de l’artiste-barbare. Pas besoin de faire preuve d’une grande imagination pour comprendre qui, à l’esprit de Chostakovitch, était ce barbare hypertrophié, barbouillant grossièrement les créations d’autres artistes et annihilant toute beauté sur son passage. Si cette musique est convenablement jouée, en obéissant aux instructions précises et détaillées du compositeur, alors sa signification sera claire. La marche semblera effectivement être un acte d’anéantissement balourd et ignoble. Nul besoin de connaître le texte de Pouchkine pour être ému par la portée de cette catastrophe. On trouvera presque incroyable que quiconque ait pu être assez insensible à la musique pour avoir vu dans ces pages la plus petite capitulation devant les exigences d’un tyran. Et pourtant l’étrangeté du finale de Chostakovitch est telle que même la démagogie histrionique en ré majeur d’un barbare enragé ne saurait entièrement ternir l’éclat du passage entendu quelques minutes auparavant, où Chostakovitch conjurait dans son esprit ses propres souvenirs de cette petite mélodie sur un texte de Pouchkine, Renaissance, écrite au tout début de ce qui constituait pour lui une nouvelle période, le début d’une nouvelle façon de penser et de ressentir les choses, à la fois dans sa vie et dans sa musique. Dans les films d’actualité et de fiction du bloc de l’Est, à la fin des années 1940 et au début des années 1950, l’après-guerre est décrite comme une période de joyeuse reconstruction, fortifiée par la victoire sur le fascisme et uniquement assombrie par la nécessité de se prendre garde au prétendu impérialisme occidental. Avec la mort d’un seul homme, le 5 mars 1953, la clef de voûte de l’édifice disparaît et après sa fausse façade, c’est tout l’édifice qui commence à s’effondrer lentement. Personne n’avait plus de raison de se réjouir de la mort de Joseph Staline que Dimitry Chostakovitch. Depuis son humiliation à l’époque des purges contre les «anti-formalistes» de 1948, il avait été démis de ses postes d’enseignant à Moscou et Leningrad, il avait été contraint de représenter l’Union soviétique lors d’une série de soi-disant congrès internationaux pour la paix où il répéta comme un perroquet ses remerciements forcés aux «sages recommandations» du Parti, et il avait dû prostituer son art en composant des musiques de films pour de veules hagiographies de Staline. En mars 1953, il avait déjà à son actif un nombre conséquent d’œuvres plus sérieuses qui attendaient d’être créées ou réhabilitées. C’est sans doute ce qui explique les huit années d’infertilité qui suivirent sa Neuvième Symphonie de 1945—il avait auparavant composé à peu près une symphonie tous les deux ans. C’est aussi de là que provient l’extraordinaire décharge d’intensité refoulée qui caractérise la Symphonie nº 10. En 1979, quatre ans après le décès du compositeur, le Témoignage de Solomon Volkov affirmait que d'après Chostakovitch, la Dixième parle de Staline et des années du stalinisme. Et en effet, quoi de plus naturel si cette musique reflétait les sentiments de Chostakovitch durant ce premier été après la mort du dictateur? Reste à savoir dans quelle mesure ces sentiments sont exprimés. Manifestement, c’est la souffrance qui est au cœur du massif premier mouvement, mais la musicalité s’y trouve aussi. Il s’agit là du plus complexe et du plus méticuleusement composé de tous les premiers mouvements symphoniques de Chostakovitch, du moins rhétorique dans ses mouvements de surface, du plus subtil dans sa monumentale construction. Il progresse avec une conviction absolue depuis sa mélancolie initiale, digne de Tchaikovski, en passant par le chant plein d’éloquence d’une clarinette et la danse intimidée d’une flûte basse, jusqu’à un bouleversant apogée central et à la plainte finale de deux piccolos. Mais cette trame pleine d’émotion s’insère simultanément dans une texture aux lignes polyphoniques complexes, lui conférant dans le langage de la musique universalité et permanence. Le maelström du deuxième mouvement se rapproche plus d’une franche description de la barbarie. Selon Volkov, il s’agit là «approximativement, d’un portrait musical de Staline». Les mots «musical» et «approximativement» sont eux aussi à méditer. Pour Chostakovitch, une fois qu’une idée musicale est née, quelle qu’en soit la source, elle mène une existence qui lui est propre et dirige le cours d’un morceau aussi bien par des moyens musicaux que par une trame programmatique. Il est toutefois au moins une énigme qui peutêtre résolue de manière satisfaisante en termes de programme. Le troisième mouvement Allegretto, qui commence avec une idée des cordes comme sur la pointe des pieds, présente deux thèmes aux significations personnelles avérées. Le perçant dessin des vents que l’on entend au bout de deux minutes environ s’appuie sur la signature musicale de Chostakovitch, DSCH; les notes ré-mi bémol-ut-si naturel font à la fois référence aux lettres qui en allemand désignent les notes et à l’orthographe allemande des initiales russes du compositeur. Qu’en est-il alors du mystérieux appel de cor a cappella qui émerge du néant deux ou trois minutes plus tard? La réponse a finalement été découverte en 1994: il épelle le nom Elmira, les notes E-A-E-D-A (mi-la-mi-ré-la) constituant un mélange sibyllin de noms de notes en français et en allemand—E-La-Mi-Ré-A. Il s’agit d’un hommage à une élève de composition venue d’Azerbaïdjan, Elmira Nazirova, qui était alors la muse, la confidente et l’objet de l’affection non partagée de Chostakovitch. Lorsque les deux noms sont enfin joués en triste conjonction—ELMIRA toujours au cor, DSCH toujours à la flûte et au piccolo, tous deux finissant par être réunis dans le temps mais toujours séparés dans l’espace—le symbolisme est accablant. La noirceur de l’introduction du finale, avec ses solos de vents désolés, est apparemment dissipée par une clarinette et des violons insouciants. Le fait que cette tentative d’enjouement ne suffise pourtant pas à outrepasser des incertitudes profondément ancrées est confirmé dans la phase centrale du mouvement, où des versions accélérées des thèmes de l’introduction reviennent accompagnées de réminiscences du brutal scherzo «stalinien». Le point critique est balayé par une affirmation claironnante de la signature DSCH. C’est en partie au chef d’orchestre qu’il revient de décider jusqu’à quel point ce mouvement d’affirmation personnelle est confirmé dans les pages finales ou si, au contraire, il demeure hanté par des spectres du passé. Il est sans doute bon de se rappeler que Chostakovitch ne vécut lui-même pas assez longtemps pour voir disparaître le réalisme soviétique ou pour assister à la chute du communisme, et il était lui-même trop pragmatique pour en envisager la possibilité. L’optimisme facile ne fut jamais son style, et il est possible qu’une ambivalence calculée fasse partie de sa formule artistique dans les pages finales de cette symphonie. Quoi qu’il en soit, c’est l’ensemble de cet ouvrage qui respire la détermination et le défi, et pas seulement la signature musicale du compositeur, fortement appuyée par les timbales. Schostakowitschs Fünfte ist eine der am häufigsten aufgeführten Sinfonien des zwanzigsten Jahrhunderts. 1936, anderthalb Jahre vor Erscheinen dieser Sinfonie, war Schostakowitsch auf Geheiß Stalins in der Presse wegen der angeblich pornografischen und modernistischen Exzesse seiner Oper Lady Macbeth von Mzensk und wegen seines Balletts Der klare Bach heftig angegriffen worden. Nach diesen Attacken wurde dem Komponisten allzu klar bedeutet, das selbst sein Leben in Gefahr war (wie natürlich auch die Leben hunderttausender anderer Menschen). Das Ergebnis war, dass er es im Sommer 1936 für klug hielt, seine eben vollendete und höchst experimentelle Vierte Sinfonie vor der Uraufführung zurückzuziehen. Vor diesem düsteren Hintergrund machte er sich daran, seine Fünfte Sinfonie zu komponieren. Und dies war auch der Hintergrund, vor dem sein neues Werk nach der triumphalen Uraufführung am 21. November 1937 berühmterweise als “schöpferische Antwort eines sowjetischen Künstlers auf berechtigte Kritik” beschrieben wurde (diese Beschreibung erschien in einer Moskauer Abendzeitung im Januar 1938, fast zwei Monate nach der bewussten Premiere). Heutzutage und insbesondere seit dem Fall der Sowjetunion haben sich viele Menschen im Westen mit dem scheinbar unfassbaren Ausmaß der stalinistischen Schreckensherrschaft auseinanderzusetzen versucht. Bücher, Fernsehprogramme und Zeitungsartikel haben uns mit einschlägigen Texten und Bildern überschüttet. Und ebenso wie bei unserer vergleichbaren Reaktion auf das, was wir über Hitler-Deutschland wissen, stellen wir fest, dass unsere emotionale Aufnahmefähigkeit in Bezug auf derartige Informationen an gewisse Grenzen stößt. Vielleicht ist das der Grund, warum die Musik Schostakowitschs in der Phantasie mancher Westler heute eine Bedeutung angenommen hat, die sie in der Phantasie vieler “Sowjets”, insbesondere mancher Russen, schon seit langem gehabt hat. Der überwältigend tragische Beiklang der Musik, ihre bittere Ironie, ihre Dramatik des Grotesken, Absurden und Banalen scheinen allesamt unser Bedürfnis nach einer imaginären Filmmusik zu bedienen, die uns hilft, die Bedeutung dessen, was man uns offenbart hat, zu verarbeiten. Die Erhabenheit, das Pathos und das schiere Ausmaß der Musik Schostakowitschs deuten auf angemessene Reaktionen hin, wenn uns die Worte zu fehlen scheinen. Wir spüren die offenbare Wahrheit in Schostakowitschs eigenem Kommentar (wiedergegeben von Solomon Wolkow in Zeugenaussage): “Was in der Fünften vorgeht, sollte meiner Meinung nach jedem klar sein. Der Jubel ist unter Drohungen erzwungen wie in Boris Godunow. So, als schlage man uns mit einem Knüppel und verlange dazu: ‘Jubeln sollt ihr, jubeln sollt ihr’. Und der geschlagene Mensch erhebt sich, kann sich kaum auf den Beinen halten. Geht, marschiert, murmelt vor sich hin: ‘Jubeln sollen wir, jubeln sollen wir’” … Manche, die in bester Stimmung zur Uraufführung der Fünften gekommen waren, mussten am Ende weinen. An dem Bericht, dass sich Schostakowitsch selbst mit dem Untertitel “Die schöpferische Antwort eines sowjetischen Künstlers auf berechtigte Kritik” einverstanden erklärt habe, könnte etwas Wahres sein. Es wäre ganz und gar typisch für diesen höchst ironisch denkenden Mann. Die Sinfonie ist in der Tat seine beeindruckend schöpferische Antwort auf Kritik, und dabei die einzige Antwort, die ihm praktisch möglich war. Was die Adjektive “sowjetisch” und “berechtigt” angeht, so sticht ihre billige Verlogenheit heute ebenso deutlich hervor wie die ähnliche Verlogenheit des Marschs im Finale der Sinfonie. Denjenigen, die bereits mit Schostakowitschs Musik vertraut waren und dieses Werk bei seiner Uraufführung im November 1937 in Leningrad unter der Leitung von Jewgenij Mrawinski zu hören bekamen, muss von den ersten Tönen an klar gewesen sein, dass hier ein Künstler in eine neue Erfahrungswelt, eine neue Art des Hörens und der Vermittlung neuer Hörweisen an sein Publikum vorgedrungen war. Man könnte meinen, Schostakowitsch habe sich zwischen den Heroismus der musikalischen Vergangenheit und den Schrecken der Gegenwart gestellt und die moralischen Ansprüche der beiden Haltungen gegeneinander abgewogen. Der erste Satz beginnt mit Musik, die zugleich als langsame Introduktion und Exposition der Sinfonie dient (und die außerdem nicht nur das Material des ersten, sondern auch, wie sich später herausstellt, der anderen drei Sätze vorstellt). Ganz am Anfang, gleich nach den ersten vier Takten kantiger punktierter Rhythmen, setzt eine wiegende Begleitung der tiefen Streicher ein, über der die ersten Geigen die erste leise Andeutung einer Melodie spielen. Diese Melodie beginnt durchaus angemessen in der Ausgangstonart der Sinfonie, d-Moll. Doch schon in der allerersten Phrase fällt sie über die fünftönige Skala ab und endet nicht auf E ohne Vorzeichen (wie es unsere Ohren erwarten würden), sondern unerwarteterweise auf Es. Der bittersüße Effekt dieser “falschen” Note (der die Musik sehnsüchtig modal klingen lässt, wie Volksmusik oder frühe Kirchenmusik) stellt den Anfang eines wichtigen musikalischen Arguments der Sinfonie dar. Man muss nicht in Musikanalyse bewandert sein, um die Kraft und Logik zu spüren, mit der der Komponist uns auf eine musikalische Reise von der bittersüßen Erfahrung eines einzelnen Tons zur bittersüßen Erfahrung einer ganzen komplexen, doch durch und durch geordneten sinfonischen Welt schickt. Interessanterweise setzt das als Allegretto bezeichnete Scherzo in a-Moll im gleichen Tempo ein wie der Höhepunkt der Durchführung des ersten Satzes. Mit anderen Worten: Das Scherzo hebt gewissermaßen dort an, wo jene Durchführung geendet hatte. Und obwohl der ganz neue Charakter des zweiten Satzes (mit seiner geradezu verblüffenden Ähnlichkeit zu einem Mahlerschen Ländler) von der Welt des ersten Satzes weit entfernt erscheinen mag, wenn Schostakowitsch beginnt, die delirierenden Fragmente der Tanzmusik im Dreiertakt zu wenden und zu verzerren, werfen sie doch allmählich Anklänge und Erinnerungen an die vorhergegangene Musik auf. Im langsamen Satz in fis-Moll wählt Schostakowitsch ungewöhnlicherweise die Aufteilung der Geigen in drei gleich starke Abteilungen und unterteilt außerdem die Bratschen und Celli jeweils in zwei Stimmen. Die daraus entstehende achtstimmige Streichertextur vermittelt der Streicherführung dieses Largos ihren eigentümlichen Eindruck von Masse und Wohlklang. Wie das Themenmaterial des Scherzos entwickelt sich das Material dieses Satzes zwar zu einer Art Sonatensatz, doch hält es unser Interesse wach, indem es ein Geflecht von Affinitäten und Beziehungen zu den Themen des Kopfsatzes andeutet. Insbesondere die abfallende fünftönige Phrase mit ihrem bittersüßen Es vom Anfang des Werks kehrt hier wieder und nimmt vor unseren Ohren vielfältig neue Gestalt an. Der letzte Satz beginnt mit jenem berühmten Marsch, “als schlage man uns mit einem Knüppel und verlange dazu: 'Jubeln sollt ihr, jubeln sollt ihr'.” Wie im Kopfsatz konstruiert Schostakowitsch auch hier mit großer Sorgfalt eine präzise und kalkulierte Beschleunigung, die der Musik eine bedrohliche Spannung verleiht. Auf dem Höhepunkt dieser Beschleunigung verändert sich der Charakter der Musik unvermittelt in einer Weise, als sei man in eine neue Zeitdimension übergetreten. Alles um uns herum ist plötzlich sanft, geräumig und beschwingt; der Schrecken und Bombast scheinen dramatisch verebbt zu sein. Und man hört, wie sich die hohen Streicher auf zwei Tönen hin und her wiegen. Diese wiegende Figur, ein sanftes Pendeln, ist ein Motiv, das in Schostakowitschs Schaffen vom Anfang bis zum Ende seines Lebens immer wieder vorkommt. Wenn es auch nicht immer im engeren Sinne als Zitat anzusehen ist, so ist es im allgemeinen doch zumindest ein Verweis auf einen der berühmtesten Momente in der russischen Musik, ein Moment aus einem von Schostakowitschs Lieblingswerken, Mussorgskis Boris Godunow. Die Stelle in der Oper, an der die Figur erklingt, ist der Anfang der Klosterszene, wenn der Vorhang aufgeht und der Mönch und Chronist Pimen zum Vorschein kommt, wie er an seinem Pult schreibt. Das Wiegen scheint darauf hinzudeuten, wie sich die Hand des alten Mannes über das Pergament bewegt. Pimen teilt uns mit, dass er mit seiner Arbeit fast fertig ist, dass er in seiner Chronik alles niedergelegt hat, was sich in seiner Epoche ereignet hat, damit zukünftige Generationen die Wahrheit über die Verbrechen der Tyrannen und das Leiden des gemeinen Volks lesen können. Pimen betrachtet sein Werk nicht als bloße Geschichtsschreibung, sondern als eine Art Richtspruch. Unter russischen Musikern und Musikliebhabern ist es heute geradezu zum Gemeinplatz geworden, zu behaupten, Schostakowitschs Werke seien nicht bloß Musik, sondern Teil einer fortlaufenden Moralchronik. Nach dem Pimen-Motiv aus Boris Godunow streut Schostakowitsch fragmentarische Hinweise auf ein Liedchen namens Wiedergeburt ein, das er einige Monate zuvor auf einen Text von Puschkin verfasst hatte. Das Lied beschreibt, wie im Verlauf der Zeit die unbeholfenen Klecksereien des Barbaren vertrocknen und wie alte Schuppen abblättern. Die Schönheit des ursprünglichen Gemäldes, das vom Barbaren überpinselt worden war, kommt wieder zum Vorschein. Allmählich verwandeln sich diese skizzenhaften Verweise in die Elemente des dritten Verses: “So schwinden die Illusionen / von meiner erschöpften Seele”, bis sich die Streicher kurz vor der Rückkehr des brutalen Marschs vom Anfang des Satzes zu einem strahlenden B-Dur-Akkord ausbreiten, über dem man die Harfe hört, wie sie fast die gleiche Musik spielt, die im Lied vom Klavier als Begleitung zum Text des zweiten Verses angestimmt wird. Was hat der Komponist also mit dem ersten Vers des Lieds angefangen, in dem beschrieben wird, wie der barbarische Künstler das Gemälde eines Genies unbeholfen überpinselt? Wie es sich trifft, erweisen sich die einleitenden Töne seines Lieds als genau die gleichen wie die ersten Töne des Finales, das Hauptthema des Marschs, mit dem es beginnt und endet. Mit anderen Worten: Dieser Marsch ist der Marsch des barbarischen Künstlers selbst. Es bedarf keiner großen Phantasieanstrengung, um zu erkennen, wer nach Schostakowitschs Meinung dieser große Barbar war, der grob die Schöpfungen anderer überpinselt und dabei alle Schönheit zunichte macht. Wenn diese Musik so gespielt wird, wie sie nach den präzisen und eingehenden Anweisungen des Komponisten gespielt werden sollte, dann wird ihre Bedeutung unmittelbar klar. Der Marsch wirkt dann in der Tat wie ein grober und scheußlicher Zerstörungsakt. Man muss den Text von Puschkins Gedicht nicht kennen, um von der Gewichtigkeit der Katastrophe bewegt zu sein. Es wird dann geradezu als unglaublich erscheinen, dass jemals irgendjemand musikalisch so unempfänglich gewesen sein konnte, dass ihm diese Musik auch nur im Entferntesten wie die Kapitulation vor den Forderungen eines Tyrannen vorgekommen sein kann. Doch zu den Eigentümlichkeiten des Schostakowitsch'schen Finales gehört, dass der erzürnte Barbar noch so demagogisch in D-Dur tönen kann, ohne das es ihm gelänge, das Strahlen jenes wenige Minuten zuvor erklungenen Moments ganz auszulöschen, als Schostakowitsch vor seinem inneren Auge die privaten Erinnerungen an das Puschkin-Liedchen Wiedergeburt heraufbeschwor, entstanden ganz am Anfang einer neuen Epoche, einer neuen Gedanken- und Gefühlswelt sowohl in seinem Leben als auch in seiner Musik. In Wochenschauen und Spielfilmen aus dem Ostblock der späten Vierziger- und frühen Fünfzigerjahre wird die Nachkriegszeit als Epoche frohen Wiederaufbaus dargestellt, gestärkt durch den Sieg über den Faschismus und nur überschattet durch die notwendige Wachsamkeit gegenüber dem angeblichen Imperialismus des Westens. Es bedurfte keines anderen Ereignisses als des Todes eines einzigen Mannes am 5. März 1953, um den Grundpfeiler dieser falschen Fassade ins Wanken zu bringen und den langsamen Kollaps des gesamten Gebäudes einzuleiten. Niemand hatte mehr Grund, sich über den Tod von Josef Stalin zu freuen, als Dmitri Schostakowitsch. Seit seiner Demütigung im Zuge der “antiformalistischen” Säuberungen von 1948 war er seiner Lehrämter in Moskau und Leningrad enthoben worden, man hatte ihn gezwungen, die Sowjetunion bei einer Reihe sogenannter internationaler Friedenskongresse zu repräsentieren, wo er seinen obligatorischen Dank für die “weise Führung” der Partei nachplapperte, und er hatte seine Kunst durch die Komposition von Filmmusiken zu Dutzenden von erbärmlichen Stalin-Hagiographien prostituieren müssen. Im März 1953 hatte er eine erhebliche Anzahl ernsthafterer Werke in der Schublade, die entweder ihrer Uraufführung oder Rehabilitierung harrten. Dieses Phänomen könnte auch dazu beitragen, die einmalig große achtjährige Lücke in seinem Schaffen seit der Neunten Sinfonie von 1945 zu erklären—zuvor hatte er etwa jedes zweite Jahr eine neue Sinfonie vorgelegt. Es erklärt auch die außerordentliche Entladung aufgestauter Intensität in der Zehnten Sinfonie. Im Jahre 1979, vier Jahre nach dem Tod des Komponisten, berichtete Solomon Wolkows Zeugenaussage, er habe von der Zehnten behauptet, sie handele “von Stalin und den Stalin-Jahren”. In der Tat wäre nichts natürlicher, als dass die Musik Schostakowitschs Gefühle in jenem ersten Sommer nach dem Tod des Diktators wiedergäbe. Auf welcher Ebene sie das tut, ist Gegenstand heftiger Debatten. Ganz eindeutig steht Leiden im Mittelpunkt des gewaltigen ersten Satzes. Aber das gleiche gilt für Musikalität. Dies ist der komplexeste und am sorgfältigsten komponierte aller sinfonischen Kopfsätze Schostakowitschs, oberflächlich gesehen der am wenigsten rhetorische, der subtilste in seiner groß angelegten Konstruktion. Er schreitet mit absoluter Überzeugung voran, von der anfänglichen Tschaikowskischen Düsternis über den seelenvollen Gesang einer Klarinette und den schüchternen Tanz einer tiefen Flöte bis hin zum überwältigenden Höhepunkt und der abschließenden Klage zweier Pikkolos. Doch ist dieses emotionale Szenario zugleich in ein Netz verschlungener polyphoner Linien eingewoben, was ihm in der Sprache der Musik Universalität und Permanenz verleiht. Der turbulente zweite Satz kommt der plastischen Darstellung von Brutalität am nächsten. Wolkows Bericht zufolge handelt es sich hierbei “grob umrissen um ein musikalisches Porträt Stalins”. Die Worte “musikalisch” und “grob umrissen” sind wiederum eine sorgfältige Überlegung wert. Bei Schostakowitsch nimmt eine musikalische Idee, aus welcher Quelle sie auch ursprünglich entsprungen sein mag, ein Eigenleben an, das den weiteren Ablauf eher musikalisch bestimmt als durch eine wie auch immer geartete Programmatik. Zumindest ein Rätsel lässt sich jedoch zufriedenstellend aus programmatischer Sicht lösen. Der als Allegretto bezeichnete dritte Satz, der mit einem gewissermaßen auf Zehenspitzen daherkommenden Motiv beginnt, enthält zwei Themen von eingestandenermaßen persönlicher Bedeutung. Das stechende Holzbläser-Motiv, das nach einigen Minuten zu hören ist, beruht auf Schostakowitschs musikalischem Monogramm DSCH; die Noten D-Es-C-H buchstabieren musikalisch in deutscher Schreibweise die Initialen des Komponisten. Was hat es dann mit dem geheimnisvollen Hornruf auf sich, der einige Minuten später aus dem Nichts auftaucht? Wie man 1994 endlich erkannte, buchstabiert er den Namen Elmira, wobei die Töne E-A-E-D-A durch eine kryptische Mischung von französischen und deutschen Tonbezeichnungen wiedergegeben werden können—E-La-Mi-Ré-A. Dabei handelt es sich um die Huldigung an Schostkowitschs aserbaidschanische Kompositionsschülerin Elmira Nasirowa, seinerzeit seine Muse, Vertraute und Objekt seiner unerwiderten Zuneigung. Wenn die beiden Monogramme schließlich in trauriger Verbindung zu hören sind—ELMIRA immer noch im Horn, DSCH nach wie vor auf Flöte und Pikkolo, endlich vereint im Zeitablauf, doch immer noch räumlich getrennt—ist der Symbolgehalt überwältigend. Die Düsternis der Introduktion zum Finale mit ihren klagenden Solo-Holzbläsern wird scheinbar durch eine unbekümmerte Klarinette und sorglose Geigen vertrieben. Dass diese Bemühung um Fröhlichkeit jedoch nicht ausrecht, um tiefsitzende Unsicherheit zu überwinden, wird im Mittelteil des Satzes klar, wo beschleunigte Versionen der Einleitungsthemen mit Reminiszenzen an das brutale “Stalin-Scherzo” einhergehen. Die Krise wird durch eine lautstarke Darlegung des DSCH-Monogramms hinweggefegt. Es ist teils dem Dirigenten überlassen, zu entscheiden, inwiefern dieser Satz der Selbstbehauptung in den abschließenden Passagen noch verstärkt wird, oder ob sie im Gegenteil weiterhin von den Schreckgespenstern der Vergangenheit heimgesucht werden. Man sollte daran denken, dass Schostakowitsch die Entthronung des sozialistischen Realismus oder den Zusammenbruch des Kommunismus nicht mehr erlebt hat, und er war zu realistisch, um eine solche Zukunft vorherzusehen. Seichter Optimismus war ihm nie gegeben, und es könnte sein, dass kalkulierte Ambivalenz zu seiner künstlerischen Bilanz am Schluss dieser Sinfonie gehört. Wie dem auch sei, jedenfalls ist das Werk von Entschlusskraft und Herausforderung bestimmt, und zwar nicht nur in der musikalischen Signatur des Komponisten, die von den Pauken eingehämmert wird.